Hanover, NH – Saturday morning Dartmouth took to Brophy Field for its last home game of the fall Ivy League season. This time the Big Green sported new kits – a crisp white with broad hoops – for the homecoming match against Brown. In addition to displaying its new fall fashion and entertaining a wholesome homecoming crowd, Dartmouth was competing to secure an Ivy League title. Knowing the Bears to be a tough and worthy opponent, Dartmouth went into the match looking to implement the systems practiced in the past weeks’ training and to improve on its performance the previous week at Yale. The Big Green established control early and didn’t look back on its way to a 90-7 victory in front of the home crowd. The junior track captain turned elusive wing, John Abraham, opened the scoring as he collected a pass on the wing and chipped from a standstill over the advancing wall of Brown defenders. Zipping onto the ball with defenders in close pursuit, Abraham played the careening ball with a decisive kick into the try zone, touching down for a try to cap off a fifty-meter individual effort. Abraham would go on to score another soccer-esque try in the next few minutes. First half tries came from a variety of players: deftly timed kicks into the try zone from flyhalf Dawit Workie led to tries by wing Max Parker and opened the field for a nice finishing run from junior fullback Ryan Maguire. When asked for his thoughts on the match, captain Madison Hughes commented, "The team was pleased to get a good result on a beautiful fall day on our beloved Brophy Field. Lots of enterprising play led to some great team tries and the supportive crowd helped the team put in a good performance on Homecoming weekend." Head Coach Gavin Hickie reinforced the sentiment of a good closing performance on Brophy Field: "We are happy with our performance yesterday while accepting there are still areas in our game that need work. We have been getting better each week and yesterday was our best performance of the Ivy Fall season to date." Late in the second half, senior Brendan Cronin and freshman flanker Benji Hannam displayed great cohesion on an 80-meter run off the first phase of a kick-off return. Cronin took a crash ball from Workie and burst through Brown line with a quick inside cut, finding a trailing Hannam at midfield with a looping pass. Collecting an offload from Hannam seconds later, Cronin fended off the Brown fullback and touched down under the posts for his third try of the day, ending the first half of play. The Big Green defense, led up front by the likes of seniors Mike McDavid and Pete Savarese, was staunch, holding the Bears to one second half score. The Dartmouth scrum dominated on the day, with seniors Andrew Berson and Nick Brown providing a powerful push and turning over many set pieces throughout the match. The second half saw trips into the try zone from Captain Madison Hughes, fresh off his stint with the Eagles 7’s squad in Sydney, Australia, and Chris Banks, a junior all-American returning from a tough ACL tear. Hughes also demonstrated his tremendous skill, versatility, and poise by casually notching a deep 40-meter drop goal in the face of charging Brown defenders late in the second half. This half also saw several reserves get extended minutes and make the most of them. Hard runs by Mick Wopinski ’15 and evasiveness on the wing from Jake Levine ’14 highlighted the closing minutes. "Our development over the fall season has been largely satisfying and through the hard work and commitment of our student-athletes, we are delighted to celebrate our 8th consecutive title as Ivy XVs Champions 2014,” said Hickie. In addition to Dartmouth’s consecutive dominance of the Ivy League trophy since 2008, this is the Big Green’s 16th title in 19 years. Hickie continued, ""From a personal viewpoint, I feel our senior class of 2015 have shown themselves to be outstanding leaders of the DRFC program. Spearheaded by Dartmouth & USA 7s captain, Madison Hughes, it has been a pleasure working with these men of Dartmouth. 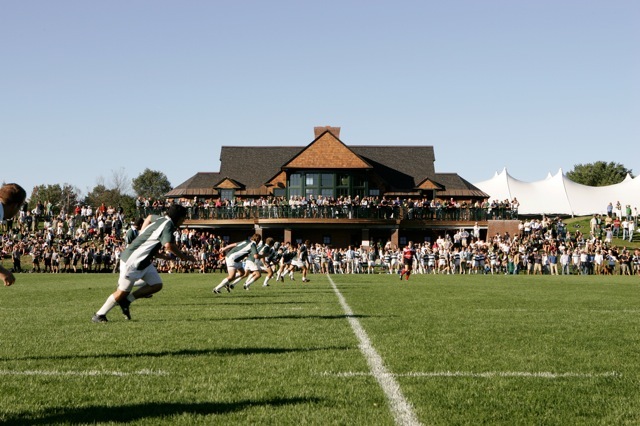 We eagerly await our final Ivy XVs vs. Columbia and our Ivy 7s Championship before we shift our focus to our spring season which includes the Varsity Cup and CRC." Hickie finished by recognizing the efforts of those who support the squad in critical, but not so visible, ways throughout the season. “On behalf of all the coaches and players of the DRFC, I would like to thank John Buck and all his ground staff for their outstanding work on Brophy and Battle [Fields] this fall season." As stated by Coach Hickie, the season continues next Friday in New York, as Dartmouth takes on Columbia under the lights in a rare Friday night match. The match will be played at the Baker Field Soccer Stadium, located at 533 W 218th St, New York, NY. Kickoff is scheduled for 7pm. If you cannot attend the match, be sure to keep up with the action live on Twitter by following the @dartmouthrugby account.